Al Falah University honored the students who won second place in the Intellectual Property Award organized by Dubai Customs which is held annually. Dr. Sameer Barghouthi, Vice President for Academic Affairs expressed his pride for the students who have exerted great efforts during the past period to win this valuable award with merit. He also pointed out the need to spread the concept of property rights protection among the members of the surrounding society. 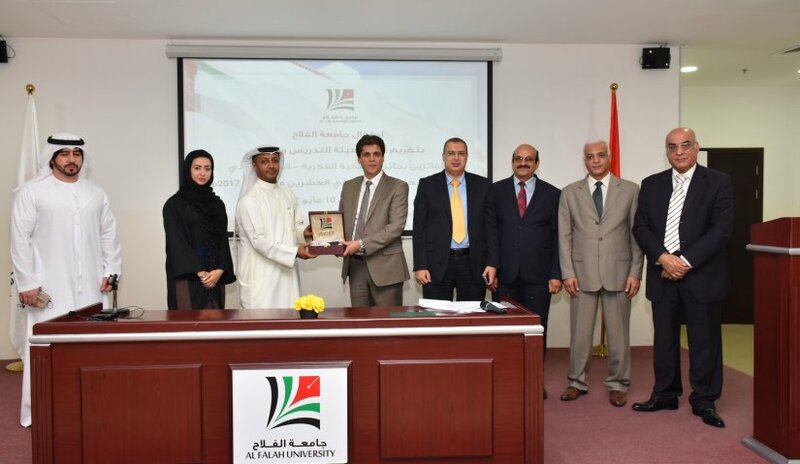 In his speech, Mr. Yousef Ozeir Mubarak, Director of the Intellectual Property Department at Dubai Customs stated that Al Falah University, despite being a newly established institution, has students able to compete with various major universities in the UAE and that winning second place is a major achievement for the students and the university. Towards the end of the ceremony, Mr. Yousef and Dr. Al Barghouthi distributed certificates of appreciation and awards to the students who participated in the competition. AFU won second place inits the first year of participating. The participation of the students in the competition on raising awareness about the need to protect intellectual property rights was under the supervision of Dr. Ezzat Al Omari, Assistant Professor, College of Mass Communication.